Use this guide to discover the differences and similarities between the two most common cannabinoids: CBD and THC. 1. Will CBD get me high like THC? No! CBD is 100% non-psychoactive, meaning no high here. But don’t worry by the time you finish reading this article you’ll understand why so many THC and non-THC users are starting to love the second most common cannabinoid, CBD. If you’re looking for the health and wellness benefits of cannabis without the high, then CBD is perfect for you. THC also increases dopamine levels, creating that sense of euphoria. TL/DR: CBD will not get you high, but it will give you many of the best benefits that cannabis has to offer. 2. Who uses CBD vs THC? The perception of marijuana users only being lazy stoners is already long past its expiration date. With legalization becoming the reality in more and more states, the formerly-taboo status of cannabis has given way to an atmosphere of increasing intrigue. As more people become aware of the many positive benefits of different cannabis strains, the demographics of cannabis users have stretched to include many people that would probably never expected to use THC or CBD. Marijuana has maintained its well deserved status as a great recreational drug with various desirable effects, and has seen an increase in recreational users primarily as a result of the debunking of many longstanding myths about marijuana. In addition to the increase in recreational use, we’ve also seen a meteoric rise in the number of medical marijuana users. As research and information has come out and we’ve realized that marijuana isn’t the devil drug it was once made out to be, we’ve seen an across-the-board rise, but an unbelievable increase in one specific demographic: senior citizens. According to Men’s Journal, senior citizens represent the fastest growing group of marijuana users, having seen an increase of 53 percent between 2013 and 2014. This is because cannabis has been shown to relieve various ailments such as joint inflammation and pain, insomnia, muscle spasms, and decreased appetite, which disproportionately affect seniors. Regular BestDosage readers and cannabis connoisseurs will realize that these positive effects people are looking for can be found in CBD and THC products, but predominantly in high-CBD, low-THC products, so there are some differences between the specific demographics of CBD and THC users. But perhaps most interesting is the fact that there are relatively few users who only consume one or the other and not both. 3. What are the top benefits of CBD vs THC? According to a report by HelloMD and Brightfield Group, the principal ailments that users reported treating with cannabis are anxiety, insomnia, joint pain/inflammation, and depression. Cannabis users of all kinds enjoy multiple benefits from both CBD and THC dominant strains, but there are slight variations in the reported effects of different products. As we continue to educate ourselves about the differences in the effects of not just strains but also consumption methods, I expect that those variations will become even more evident. As indicated, the infographic above is about what percentage of CBD or THC users report using cannabis to treat those specific ailments, but there are many other benefits of cannabis. Also, I expect the gap between these numbers to grow as we continue to learn more about the efficacy of different strains and start selecting for specific benefits. The medical community is still doing research to determine the full range of applications both THC and CBD may have, but this is a list of the most commonly reported positive benefits that people are seeking when they consume cannabis medicinally. 4. What are the common forms of CBD vs THC? Because they are both derived from cannabis, CBD and THC are available in the same forms. While flowers are still by far the most popular form of both CBD and THC, and edibles have long been a popular way to consume, there is growing attention towards the many different forms of concentrates available today. There’s so much new terminology that sometimes when I’m reading an industry article I feel like I’m reading Harry Potter or Clockwork Orange, so don’t be alarmed if you don’t recognize every word on this list. 5. How should I consume CBD vs THC? Just as there are numerous forms of cannabis, there are accordingly numerous ways to consume cannabis. 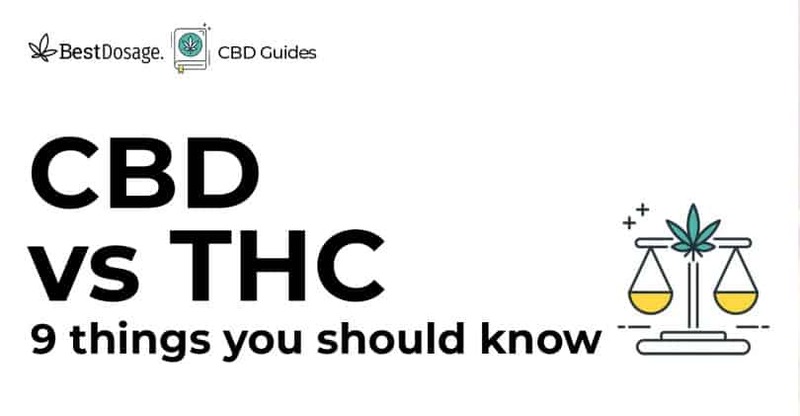 THC and CBD can both be consumed the same ways, so it really depends on what you’re comfortable with, what your desired effects are, as well as when and where you’re going to consume. Different methods have different efficacies, require different periods of time to take effect, and have different stigmas associated with them. There’s really no right or wrong way to consume, as long as you do so responsibly, and don’t forget to track your dosage so you can be a better consumer. Just so you know where the crowd stands, here are some interesting statistics about how and what cannabis users consume. I imagine we will see an increase in the usage of topicals and tinctures as their benefits continue to be shared and they become more readily available. As for capsules, I also think their usage will increase as more and more people use cannabis to reduce their dependency on pharmaceuticals and opioids. 6. Are CBD and THC legal in every state? CBD and THC have different applications, different effects, and therefore they have different legal statuses, which vary from state to state. Although both THC and CBD can be used recreationally and medically, the layman’s breakdown would be that THC is predominantly used recreationally, whereas CBD is typically consumed for medical purposes. 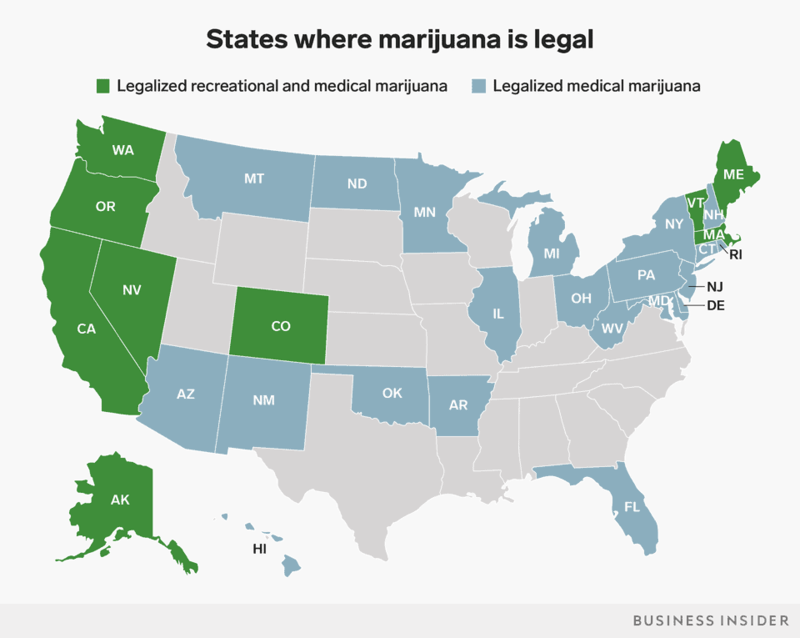 We’ll get more into CBD-specific legality in a moment, but first, here’s a map from Business Insider of states in which marijuana (includes THC and CBD) is legal. That’s right – 30 states now allow medical marijuana, 9 of which also legalized recreational use. As for the legality of CBD without THC, there is still quite a bit of confusion as to whether or not it’s allowable. However, the World Health Organization has concluded that CBD is not harmful and recommended that it not be scheduled as a controlled substance, and the World Anti-Doping Agency recently removed CBD from their list of banned substances. Many celebrities are now endorsing various CBD products, ranging from cosmetics and candies to salves and vapes, and you can order CBD oil in all 50 states on Amazon. So, as I said, it’s still unclear. The primary source of this confusion is that there are different terms used for cannabis, namely hemp, and marijuana. Hemp traditionally refers to cannabis plants grown for their fiber content, and marijuana has historically referred to the high-THC psychoactive strains. These are messy definitions, but the 2014 Farm Bill defines “industrial hemp” as any part of the cannabis plant with less than 0.3% THC, and 40 states currently permit at least some form of legal growing. 7. What are the side effects of CBD vs THC? 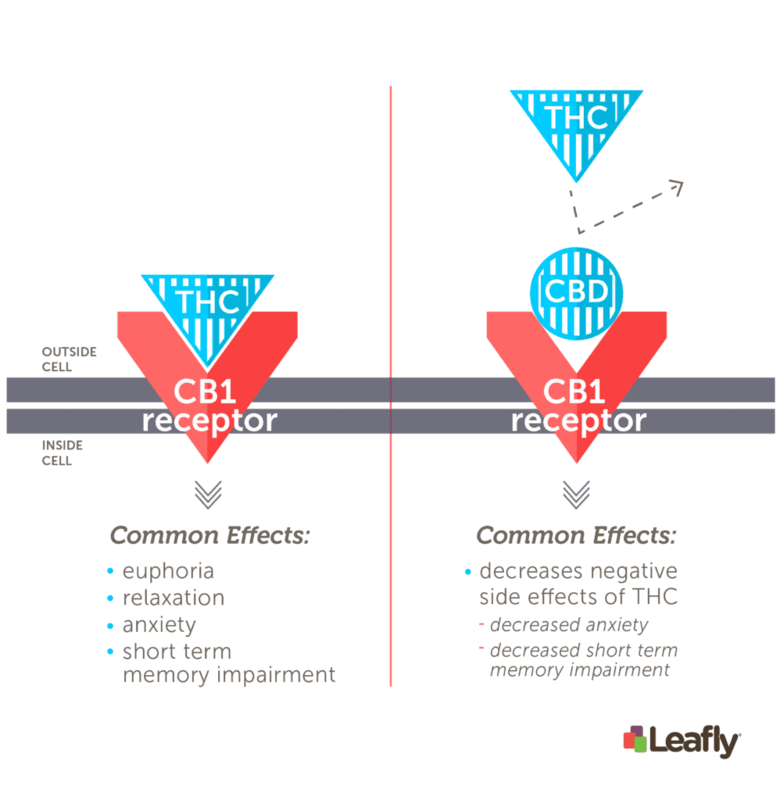 An important difference between CBD and THC is in their side effect profiles. Due to the different ways in which they interact with the endocannabinoid system (ECS), CBD and THC have different side effects. Especially when compared to the many pharmaceuticals that CBD can be compared to, the side effect profile is incredibly favorable. From Tylenol and BenGay to Vicodin and Ambien, CBD products can provide comparable benefits but without the nasty side effects, and consequently, many people are becoming converts to CBD and leaving their pills behind. Personally, I’ve always preferred not to take pills if I don’t have to, but I’ve tried many different herbal and traditional remedies that were sadly ineffective, so I’m elated to finally see some traction with using CBD as an effective treatment that can supplant select pharmaceuticals. 8. Will I get withdrawal symptoms if I stop taking CBD vs THC? Okay, I’ve been waiting for a chance to share this graph, because it kinda blew my mind. Check it out for yourself, and we’ll catch up and unpack it on the other side. So, did you see it? 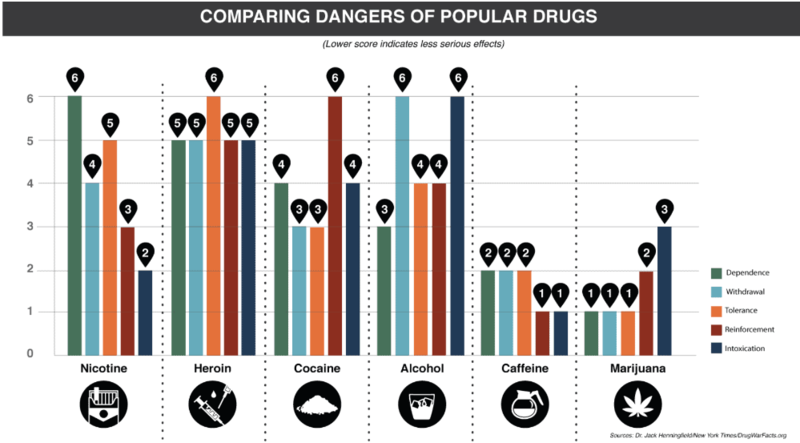 Let’s review: when comparing nicotine, heroin, cocaine, alcohol, caffeine, and marijuana, marijuana actually presents the lowest risk of dependency and withdrawals. That’s right, you’ll have a harder time getting over your daily dose of java than you will be giving up marijuana. So the withdrawals are minimal, and you’re unlikely to become dependent in the first place. Not bad. 9. What happens if I mix CBD and THC? Remember when I said that CBD and THC interact differently with the ECS? Well, in fact, CBD can actually limit some of the undesirable effects of THC, so they can be used in concert to mitigate the negative effects. You’ll find opinions both supporting and disputing the efficacy of consuming CBD and THC together, but in my experience, it’s quite nice. But, in all seriousness, I’ve found that consuming CBD really helps mitigate these two side effects, without harshing my mellow. Conclusion? I recommend you try it out and decide for yourself.